I am co-editor, with Norm Yoffee, of this new books series that will be published by Cambridge University Press. We envision publication of at least 6 books during the initial three-year period. Each book will be based on a seminar at the Amerind Foundation and is expected to push the boundaries of research and practice in sustainability. 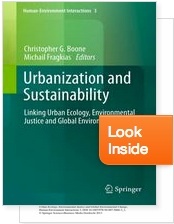 This an an edited volume for Springer Press that investigates ways that urbanization can be just, sustainable, and meet the challenges of global environmental change. We argue that environmental justice, rooted in the social sciences, and the natural sciences can fruitfully combine theory, data, and methods to detect and understand environmental consequences and processes that lead to inequitable environmental benefits and burdens. The book also stretches the domains of environmental justice research through an examination of cases studies beyond the United States and Western Europe. It is published as part of the Human-Environment Interactions series, edited by Emilio Moran. Unlike the usual anti-urban lamentations, I am cautiously optimistic about the potential for cities and urban life to lead to sustainable solutions. I was pleased to see that the latest UNFPA report on urbanization expresses the same belief. In 2006, I was awarded a National Science Foundation grant through the Human and Social Dynamics competition. The co-investigators on that grant are Geoff Buckley, a geographer at Ohio University, Morgan Grove, a social ecologist at the USDA Forest Service in Vermont, Charlie Lord, an environmental attorney at Boston College, and Austin Troy, an economist at the University of Vermont. Senior staff include Jarlath O’Niell-Dunne, a remote sensing expert at the University of Vermont, and Chona Sister, a GIS expert and a post-doctoral fellow at Arizona State University. 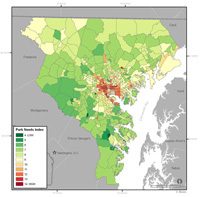 This award provides funds to investigate the long-term (1880-2000) dynamics of environmental inequity in the Baltimore Metropolitan Region. Findings from this research will be extremely helpful in understanding the processes of environmental inequity formation, which are often legacies of past decisions and dynamics. As a region that has experienced severe economic decline in the core and rapid urbanization on the periphery, lessons from the study will inform the human-environmental dynamics of other cities, and hopefully lead to more sustainable and equitable management of cities in the future. The complete abstract of this project is available here. I am senior personnel on a NSF award (Jennifer Glick, p.i.) that examines the impact of stricter immigration policies and practices on Latino communities in Phoenix, Arizona. In particular, it assesses how a “chilling” immigration environment influences social networks, resource flow, and household reorganization, and how those social dynamics may impact the well-being (health and economic) of individuals and households. Since 1999, I have been actively involved in the Long Term Ecological Research (LTER) network. This network of 26 sites seeks to monitor and understand ecological systems and dynamics over long periods of time. In particular, I have conducted research for the two LTER sites that are explicitly urban: Baltimore Ecosystem Study (BES) and the Central Arizona Phoenix (CAP) project. Both of these projects adopt a broad view of urban ecology, one that includes human beings as internal rather than external to the system. Urban ecology examines of the interactions of coupled human and ecological dynamics, what is sometimes called socio-ecological systems. This line of thinking is now being adopted across the LTER system, and I had the good fortune of helping to draft a document that will lead the network in that direction. Most of my work for the BES and CAP has focused on environmental inequity analysis, including the legacy of historical processes on present patterns and dynamics. For the BES, I have also undertaken research that examines health conditions and infrastructure, including the politics of sewer provision. I am the principal investigator for an ULTRA proposal, “Urbanization, land use, and water along a Southwestern socio-ecological gradient,” that examines the role of ecosystem services and preferences in land and water use decision-making at the wildland-rural-urban interfaces of Phoenix, Albuquerque, and Las Cruces. I am a co-investigator on an ULTRA headed by Stephanie Pincetl at UCLA’s Institute of the Environment. The two-year project, “Dynamics of Urban Ecosystem Services and Their Relationship to Ecohydrology: Exploratory Study for a Los Angeles Urban Long-Term Research Site (LA-ULTRA),” will focus on water management and water consumption associated with the urban forest and outdoor landscaping in the city of Los Angeles, CA. What is the institutional framework for water management in the city of Los Angeles? What is the magnitude and variability of landscape water use in the city? What is the spatial distribution of urban vegetation, and how does it relate to landscape water use and to socio-demographic differences? What ecosystem services are supported by landscape water use and what are some of the potential costs of such services? I am also a co-investigator for an ULTRA focused on Baltimore and Washington, D.C., “Urban Sustainability and Push-Pull Drivers of Residential Change: Washington, D.C., Baltimore, Maryland, and the Chesapeake Bay,” headed by Ali Whitmer at Georgetown University. This project will fund a series of distributed graduate seminars to examine the dynamics of neighborhood change using a panarchy framework. In December 2006, I was a member of a ASU delegation that visited Beijing to begin collaborations of joint interest between scholars and students in the Chinese Academy of Sciences and ASU. The establishment of the Joint Center for Urban Sustainability (JCUS) between ASU and the CAS was an important mechanism for collaborative research. In 2008, I presented a conceptual paper on linking ecology and environmental justice and attend a meeting of the International Human Dimensions Program (IHDP) in Bonn, Germany. I collaborated with Michail Fragkias, director of the Urbanization and Global Environmental Change (UGEC) project, housed at ASU. For the past two years, I have sat on the Scientific Steering Committee of UGEC, and just returned from the annual meeting in Taipei. In spring 2012, I will be presenting a paper at the Planet Under Pressure conference, the lead up to the Rio+20 gathering. In October, I was part of a team of LTER researchers that met with zones ateliers (similar to the US LTER network in concept) researchers in Rennes, France. I am working with French and American colleagues to develop a proposal for a distributed graduate seminar at the newly opened Socio-Environmental Synthesis Center in Annapolis, MD. The course will examine a select number of US and French urban sustainability plans from ecological and socio-cultural perspectives. Next fall, I will be participating as a rapporteur and lead writer in an Ernst Strüngmann Forum in Frankfurt. The forum will bring together 40 leading international scholars organized around four interrelated themes of inquiry–finite land resources and competition, distal land connections, decision-making, governance and institutions, and reconceptualizing urban land use–and the results will be published by MIT Press. With Alex Brewis, professor of medical anthropology at ASU, and others, I have also started some research on health disparities in South Phoenix, a historically latino community. In spring 2007, I participated in a research study on the walkability of neighborhoods in Phoenix, as well as a park equity study. PhD students Bethany Cutts and Kate Darby are the lead authors on a realted paper that is forthcoming in Social Science and Medicine. I am presently working with Jenny Sandlin and Seline Szkupinski-Quiroga on the role of the built environment, including advertising, in the prevalence of obesity, which is especially pronounced for ethnic minority populations.